Whereas US financial markets dominated much of the world this past year, international ones—both developed and emerging—have begun to prove more promising than the US. Indeed, while the SP500 garnered a healthy return of over 5% through 4/21 (year-to-date), developed International markets, as proxied by the MSCI EAFE index, approached a 7% return and emerging markets, as proxied by the MSCI EM, approached almost 12%, year-to-date. All the while, the US dollar is close to where it was at the beginning of the year against many currencies, which means foreign investors enjoyed returns similar to dollar-based investors. On the other side of the risk spectrum, bonds, in contrast to (most) everyone’s expectations, and despite the FED raising the Fed Funds Target to 1% and perhaps doing so several more times later this year, the 10-year US Government yield has fallen from 2.43% to 2.24%. The net result has been that most bond markets have enjoyed overall returns this year of around 1-3%, depending on the region, credit quality and maturity. see rates rise (he says he actually likes Yellen and her lower interest rates). Thus, financial markets have again adjusted based on this new worldview. As can be seen, more than ever, market returns are strongly correlated to policy shifts: a higher correlation means a stronger relationship. 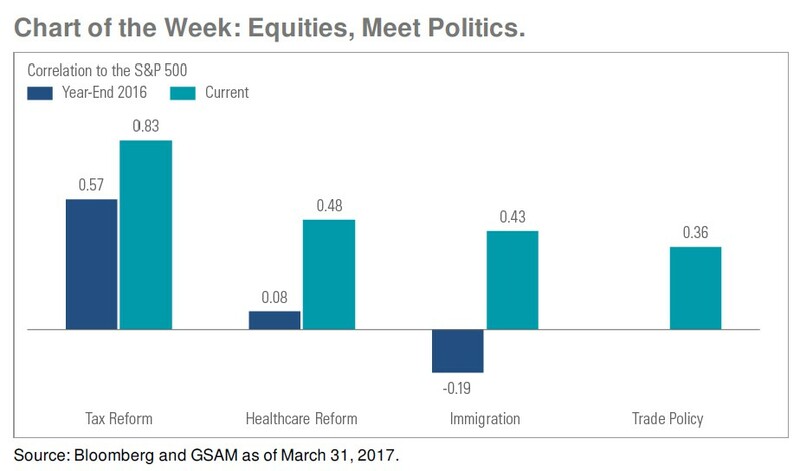 This chart also suggests that top-of-mind for investors is tax reform. But what does this all mean for you? It first means that as the political ships turn, so too will market values. And since this is also a year with some significant new policies being passed (or failing to be passed), expect increased volatility throughout the year, as these policy directions become settled. But more important than this is in the longer-term, it should not frankly matter that much for financial markets. Do you remember the dramatic government shutdown in 2013? My daughter sure does. She was very upset we couldn’t see some park buildings during our family vacation. During this time, I recall many investors thinking it was a good time to get out of the US stock market. What has happened since then? Well, the US stock market, as measured by the SP500 is up over 40% since then. And now we face another potential government shutdown this very week! Of course, this doesn’t mean that this time it will be the same as it was last time (in fact, I’d say there is a much lower probability of shutdown this week and thus a higher probability of a non-event).